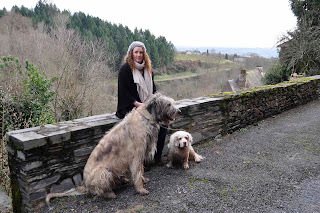 The saddest news is that we have lost Faust, our Irish Wolfhound. He had a heart attack in the back of our car. He wasn’t even three years old, so it was a great shock and we miss him very much. Our Library goes from strength to strength. It has been fairly quiet over the winter, but we have recruited a number of new members and we have a number of plans for 2013. 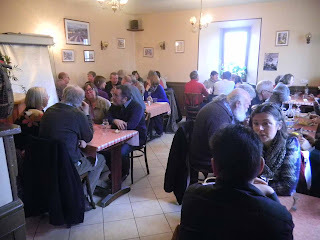 To raise funds we had a Fish & Chip lunch in a small Bar Tabac near the library. The owner kindly let us use his kitchen, and between some of us committee members we produced a meal of home-made soup (my contribution), fish, chips and mushy peas and apple tart and custard. We fed some 45 people and it was pronounced a great success. Next we plan to have a curry lunch. Our weight loss has slowed down a bit, but we are trying to stick to our diets. I have lost about 10k and Judy over 8! We’ll keep at it. A high spot recently was having a bath fitted in our house –it replaces a shower and we still have a shower in our guest room. It is really nice to be able to relax in a nice hot soapy bath – worth every € it cost. The weather has been pretty changeable, but nowhere near as bad as we hear it has been in UK. 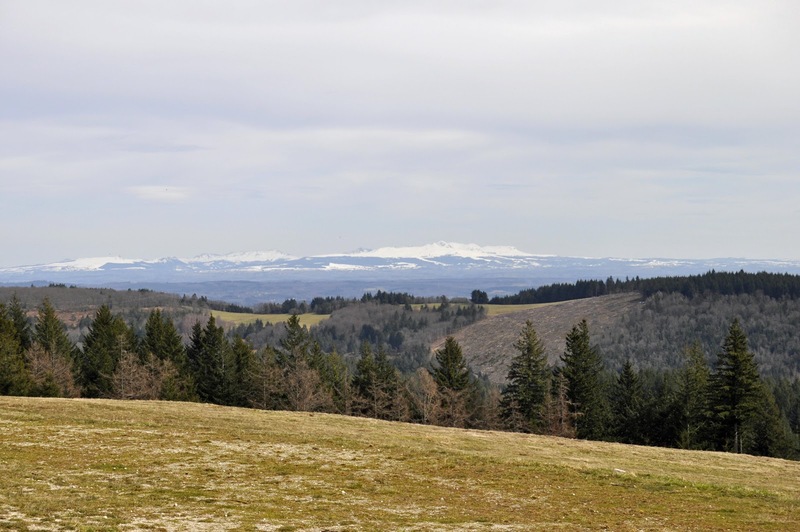 We had a slight spattering of snow in Voutezac, but it cleared within a few hours. 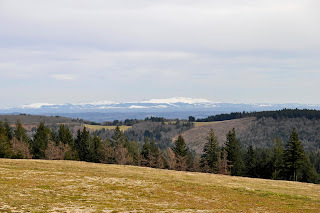 We had a trip out to the east of Correze a couple of weeks ago and even at the highest point in the Limousin, Mount Bessou, the temperature was in the low 20s. Mind – there was still some unmelted snow at the sides of the road. Mount Bessou is 977m above sea level, so they have built an observation tower which I am guessing is just over 23m high, so you can clear the 1,000m. Anyway the views are fantastic. We also visited the site of a Roman Villa - Bertie enjoyed the view as well. Another good day out was walking with Bertie around a local lake - a lovely day and a nice cold drink at the refreshment bar at the end. I did a very interesting floorplan job in a local village –a nice large house with a big garden. 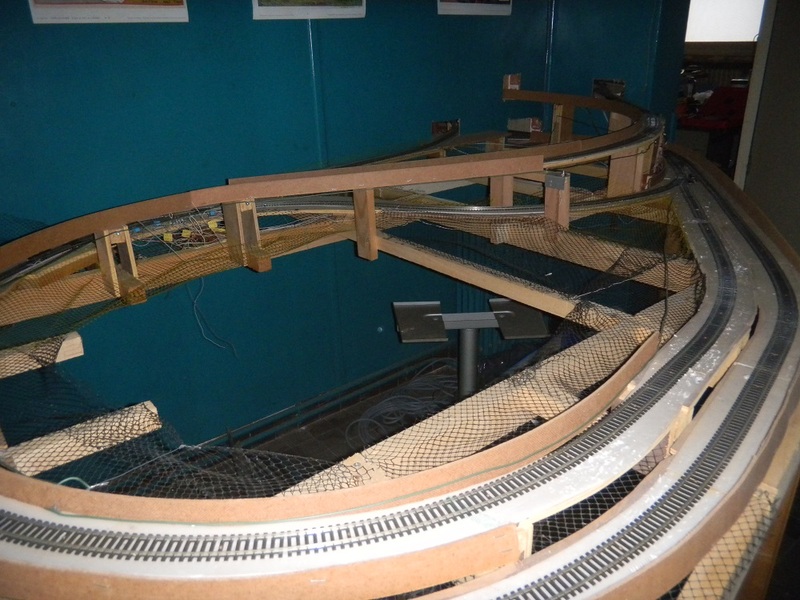 It also has two attached flats, and in one there is the most enormous train layout. It is actually in 3 or 4 rooms, with holes knocked in walls to accommodate it. Not sure if it is an attraction or not – it must have cost a fortune. Shopping in a local store I glance at a selection of children’s’ books near the till. One caught my eye “Mes Amis Les Canards”, a sort of Ladybird book with a picture of fluffy ducklings on the cover. In an area of rural France where duck is the meat of choice in restaurants, where Foie Gras is the local delicacy and even a supposedly vegetarian omelette comes with a drizzle of duck related sauce surrounding it this rather amused me. Our village boulangerie shut last year, and we accepted that a small village like ours could not really support its own shop, with a large town only 5 minutes’ drive away. At the start of the year we got our copy of the annual full colour glossy report from the Mayor and council. Having no boulangerie was insupportable! The commune will buy and restore the shop and adjacent living accommodation, and get new tenants. Mind, nothing has actually happened yet…. Our brand new Mairie is almost finished and should open any day now. 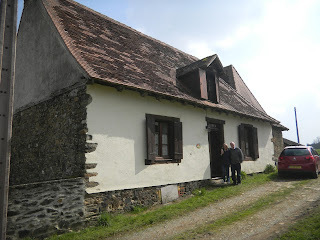 The village post office was closed by La Poste some time ago, and that was also taken over by the Mairie and the staff paid by the commune. It will be moving into the new building as well. Had a few medical forays – Judy has painful knees so went to Brive to have them X rayed. She then saw a specialist who said that she could have an injection in one knee – done the next week, and should have a course of physio on other which we have yet to arrange. We have just had two friends staying who have bought their own holiday cottage about 40 minutes from us. They have got it to a habitable state after lots of hard work, and we cast them off to sleep in their own beds a couple of days ago. We have a busy week coming up. We are celebrating our 40thwedding anniversary soon, and we then have more visitors coming to stay. Tell you all about that next time.